A minor girl was allegedly raped by two men for about eight months following which she has become pregnant. The culprits have been arrested, police said. 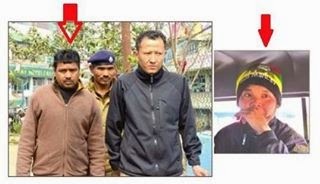 The accused persons, a businessman of Chapara area in Bihar, and a resident of upper Pesok, Gitdabling in Kalimpong, had been sexually assaulting the girl since October last year. The duo raped the girl till February 1 this year at several places, including the girl's house in the same area, their house and a secluded place nearby. They also threatened her with dire consequences if she revealed the offence to anybody, a police officer said quoting the complaint filed by the girl. Reportedly, the local Village Development Committee had organized a two day programme on February 8 and 9, called Life School for Transformation Development which the girl was attending, when she suddenly became sick. The volunteers took her to the nearby health centre where the doctor was shocked to find that she was pregnant. Unable to believe that their daughter could be pregnant, her parents took her to Siliguri to conduct an ultra-sound test in which pregnancy was confirmed. The minor then informed her mother about the incident.